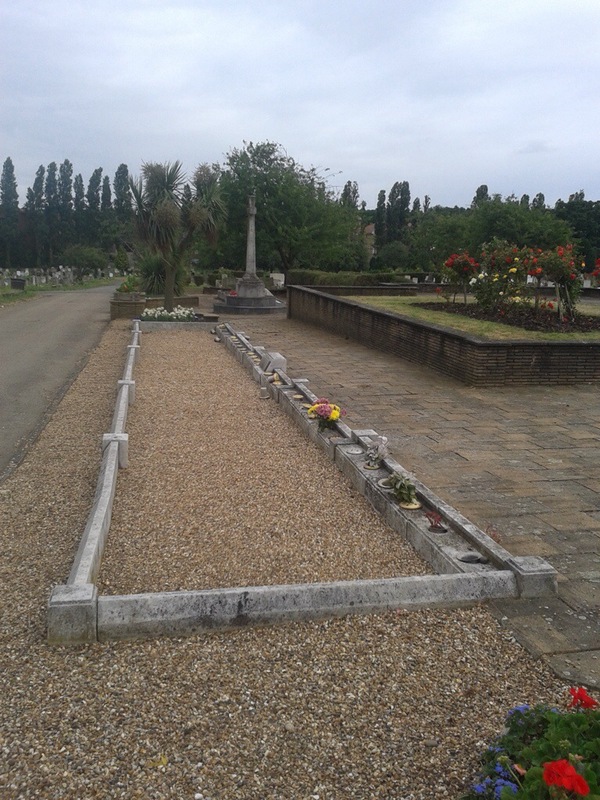 Perhaps the most depressing and bleak of Lewisham’s World War Two memorials can be found in Hither Green Cemetery on Verdant Lane – it is to the 38 children and 6 teachers who perished in a daytime bombing of Sandhurst Road School on 20 January 1943. The school between Minard and Ardgowan Roads had been opened in 1904 – midway through the development of the Corbett Estate – it was not that dissimilar to many of the era, including the one on Eltham’s equivalent Corbett Estate. The opening ceremony was performed by the Chairman of the London County Council (LCC), J Williams Benn – grandfather of the late Labour politician Tony Benn. The LCC had just taken over responsibility for London’s Schools including those in Lewisham, from the London School Board. While many children had been evacuated from London during the Blitz of 1940 and 1941 most had returned to the capital. It was to be another 18 months before V-1 rockets started hitting south London. There were though a few sporadic attacks designed to terrorise the civilian population in the intervening period – often in relation for Allied bombing raids on German cities – these became more organised towards the end of 1943 with Operation Steinbock. The facts as to what happened are quite simple; it was lunchtime at Sandhurst Road School on 20 January 1943. A group of 28 Focke-Wulf 190 Fighter-Bombers, escorted by Messerschmitt Bf 109 fighters (totalling about 60 planes), had taken off at around noon in occupied northern France and had evaded air defences and one of them was able to fly low over Catford and Downham. One of the Focke-Wulfs was seen over Downham Way spraying bullets towards those on the ground; soon after it flew over Ardogowan Road, just above the roofs of the Corbett Estate, it was carrying a single 500 kg bomb. 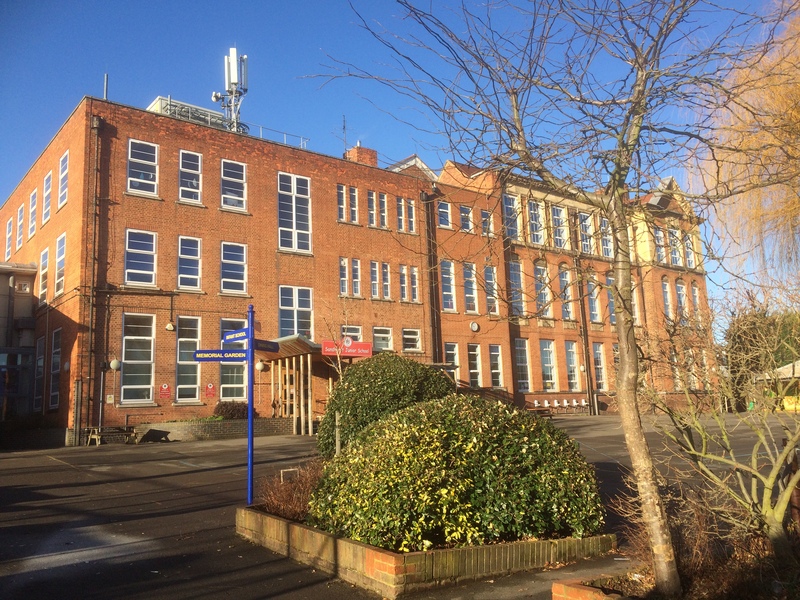 At just before 12:30 the plane flew over Sandhurst Road School, there were reports that the plane looped around the school with the pilot waving to children in the playground. On the ground the bell for lunch had just gone – a few children heard a distant air raid warning siren. Some pupils made their way to the air raid shelter – oddly a bricked up classroom on the second floor. The sound of the plane was heard and a few outside realised that it had black crosses of the Luftwaffe. transformed from neatly dressed school girls into ghastly frightening creatures, covered all over in dust which was choking us too and some of us bleeding from cuts …somehow, there was no panic — just bewilderment. Choking, bleeding and with tears streaming down our faces, we made our way out of the shelter, over girders, plaster, bricks, wood, glass ….. through the debris … there was a huge smouldering gap below us were the bodies of those children (who had been queuing up for lunch), some dead, some dying, some in terrible pain. it seemed that every available man in the locality was there, digging, some with their bare hands, as was my brother, frantically searching for loved ones, hearts and hands torn. Boys in the services home on leave, digging, searching, all through the night. The Red Cross, the women in the church hall just across the road making tea, tending those brought into the hut, even the vicar in his shirt sleeves had been there since the search had begun. All with one motive, even if it meant constant danger from falling rubble — to get those little mites out. Despite the claims of the pilot waving at children there is some debate as to whether the pilot realised that it was a school – his report on the raid noted that the large building destroyed was block of flats. However, other local schools though seem to have been attacked by machine gun in the raid, not necessarily by the same plane though, including at the nearby Catford Boys School and at Prendergast (then on Rushey Green) and a little further away on Ilderton Road, off the Old Kent Road. In addition to the attack on Sandhurst Road School and the indiscriminate machine-gunning of civilians, which killed six and injured fourteen, there were several other local bombings in the same raid – the recorded ones are serious damage to several houses in Woodlands Street, off Hither Green Lane; Woodham’s Yard on Sangley Road (covered in happier times in Running Past in 2017) took a direct hit with six perishing and 14 injured; and four houses were demolished in Glenfarg Road (1). 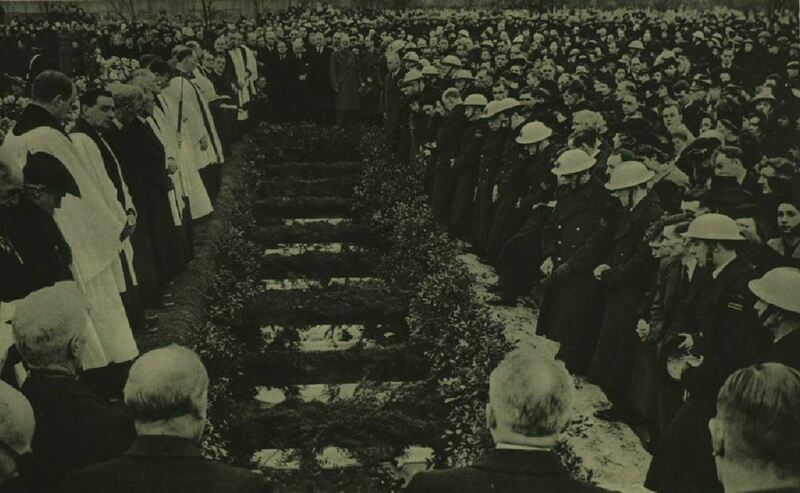 Most of the victims, 31 children and one of the teachers, Harriet Langdon, were buried together at Hither Green Cemetery in a civilian war dead plot a week later after a memorial service at St Andrew’s Church on Torridon Road. The photograph of the crowded cemetery from the Illustrated London News, below (2), with the small coffins is perhaps the most poignant one relating to the bombing, much more so than those of the destruction to the school. “Children walked past the grave – snowdrops narcissi, anemones drifted over the silver name plates. A girl twitched my coat. She said “Can you see Rodney’s names down there? I’ve brought violets for him. They’re the first from the garden. When the school at Lewisham was hit, she spent hours searching in the debris for Rodney, her six-year-old brother. Unsurprisingly, most of the victims lived relatively close by, within a mile and a half or so of the school; there were still some who lived some distance away – their parents perhaps moving after the child had been admitted to the school. As has been noted in other posts on World War 2 bomb and rocket damage, despite the war there was still a lot of movement between homes in an area where the private rented sector was large and security of tenure limited, but obviously too because of damage to homes in the Blitz. The biggest concentration was around South Park Crescent where 5 of the victims lived. 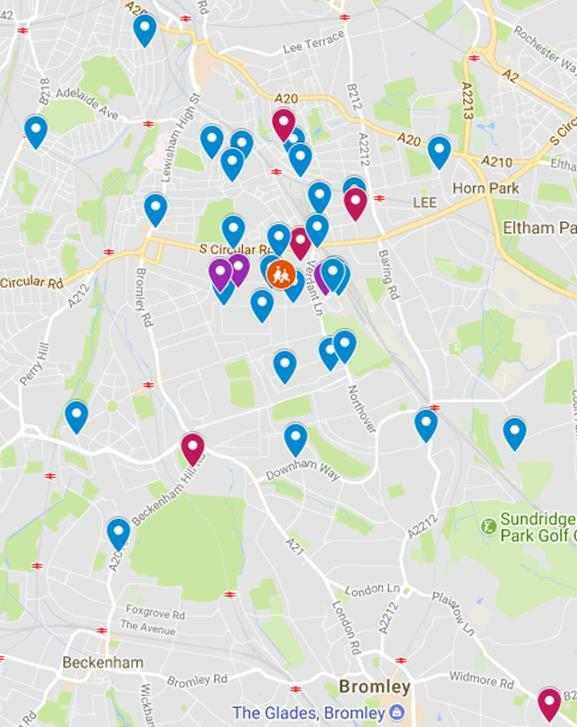 The orange ‘pin’ marks the school, blue pins children, purple the homes of two siblings and red, the homes of the teachers who died (one is off map in Surrey). The data came from the CWGC website. There don’t seem to be any equivalent daytime attacks on Berlin schools by the RAF, although attacks tended to be at night time to avoid the German air defences. There were in total just over 67,000 British civilian deaths during the war – a figure dwarfed by the numbers of ordinary Germans who died – estimates vary from 1.5 to 3 million, including thousands in the Charlottenburg area that Lewisham is now twinned with. But it seems that this Terrorangriff, terror-raid, may have been a reprisal, demanded by Hitler, for a RAF bombing of Berlin on 17 January 1943. That so many bombers got through the air defences without adequate warning and allowing such a catastrophic loss of young life to occur seems like an abject failure. The Air Minister’s explanation was it was initially thought that the raid was heading for the south coast and it was policy not to send warnings to London unless it was certain that the raid was heading that way. Otherwise the Germans could have easily sent Londoners scurrying into shelters every few hours by sending planes over Kent. It appears that of the 60 planes, it was a smaller group of around 12 that peeled off towards London which was initially missed and as a result warnings were late (4). The school was rebuilt after the war and remains – there is a memorial garden of remembrance to the victims and a stained glass window. There are several contemporary videos that include footage showing the devastation of the school, including this one. There are some memories of a survivors of the attack in a documentary made to mark the anniversary of the start on World War 2. 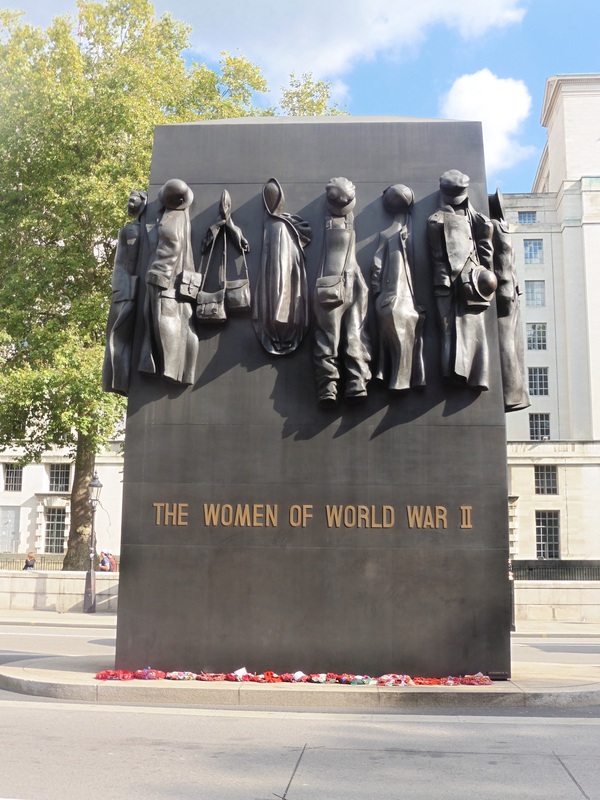 This entry was posted in Lewisham History, War Memorials and tagged Corbett Estate, Hither Green Cemetery, Sandhurst Road, Sandhurst Road School, South Park Crescent, Verdant Lane, World War 2 on January 17, 2018 by Paul B.